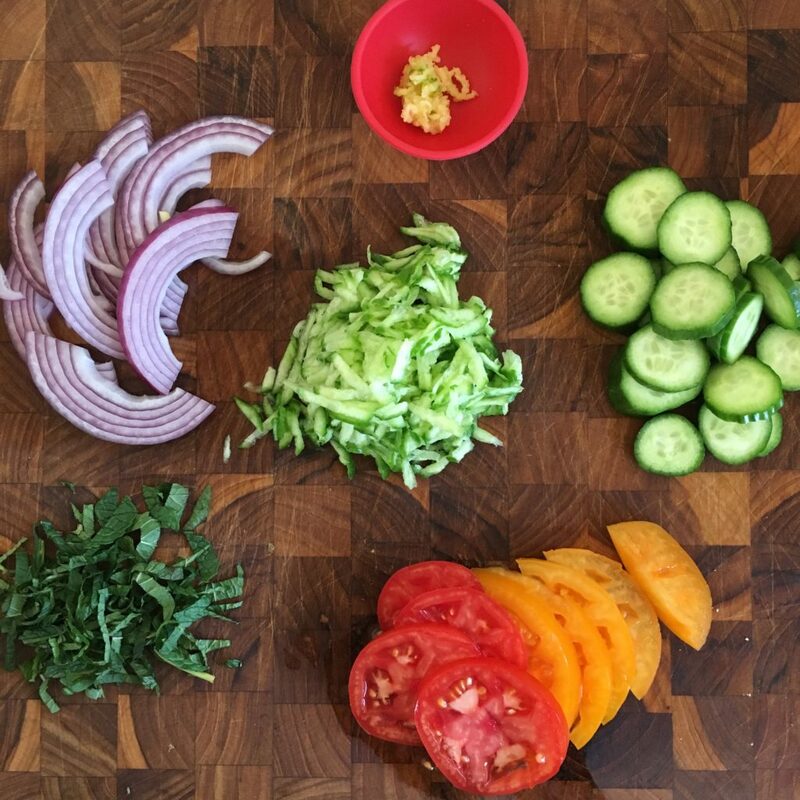 About this time every year the weather eases up just enough to let our minds wander towards spring and dare we say it, summer days where fresh, colorful veggies are a kitchen staple. This year warm beaches on the Mediterranean Sea came to mind so we decided to whip up a recipe that would take us one step closer to fulfilling our daydream. 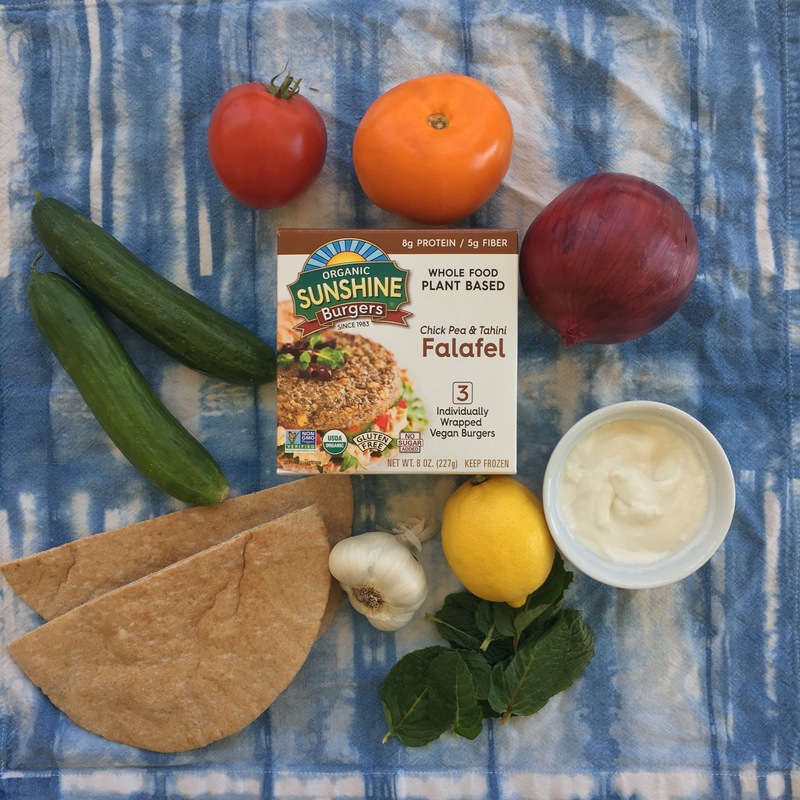 The Falafel Sunshine Burger, packed with plant-based protein from organic sunflower seeds and organic chickpeas, is full of the rich flavors of the Mediterranean and pairs well with the crisp cucumbers and acidity of the tomatoes, onions and garlicky tzatziki in this recipe. We LOVE how the unsweetened almond milk yogurt was an easy swap for dairy in this case and it tastes exactly like dairy-based yogurt. Instead of having to prepare a falafel mix and form falafel balls our burger makes it easy to just break into half-moons and serve! Prep – wash and dry all produce. Grate half the cucumber let sit on paper towels to drain. Slice the remaining half of the cucumber. Halve the onion and thinly slice ¼ of it. Cut the tomato into slices. Pick the leaves off the mint and finely chop and place in a bowl. Chop the garlic and place in the bowl with the mint. Set all other chopped veggies aside. Combine Tzatziki ingredients – mix the yogurt, cucumber, mint and garlic in a bowl. Season with salt and pepper and drizzle with olive oil. Stir until evenly combined. Heat the burgers – preheat the oven to 400 degrees. 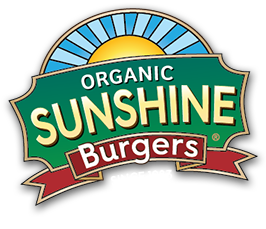 Place two burgers on a sheet of parchment paper on a baking sheet and heat approximately 7 minutes or until warmed through and edges are browned. Remove from oven and cut in half. Warm the pitas – cut the pitas in half and place on the baking sheet next to the burgers for 1-2 minutes until warm. 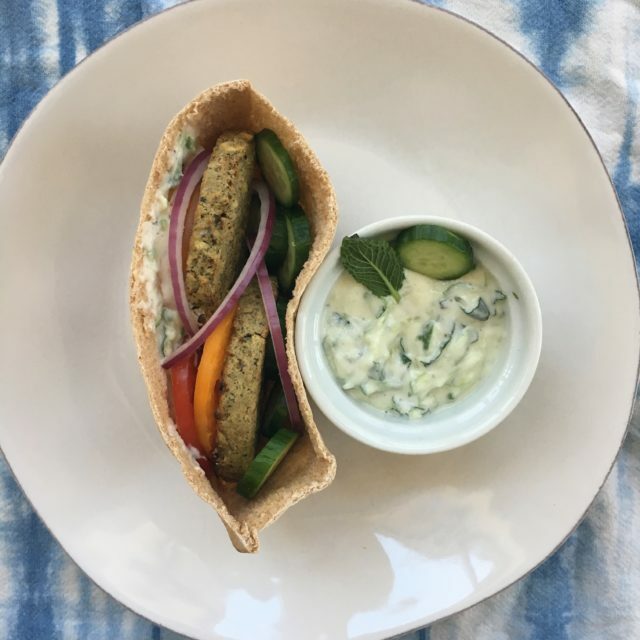 Assemble – Place two halves of the burger in the pita pocket, fill with slices of cucumber, tomato and onions; spoon in desired amount of tzatziki. We like to serve with more tzatziki on the side! We hope this recipe gets you excited about a healthy warm season ahead. Enjoy!